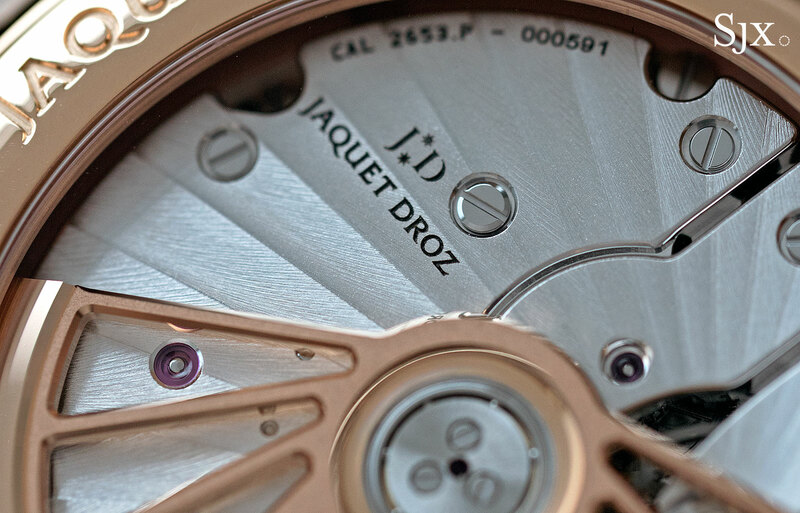 One of the foundational watches of the modern Jaquet Droz brand are its Paillonnée watches. 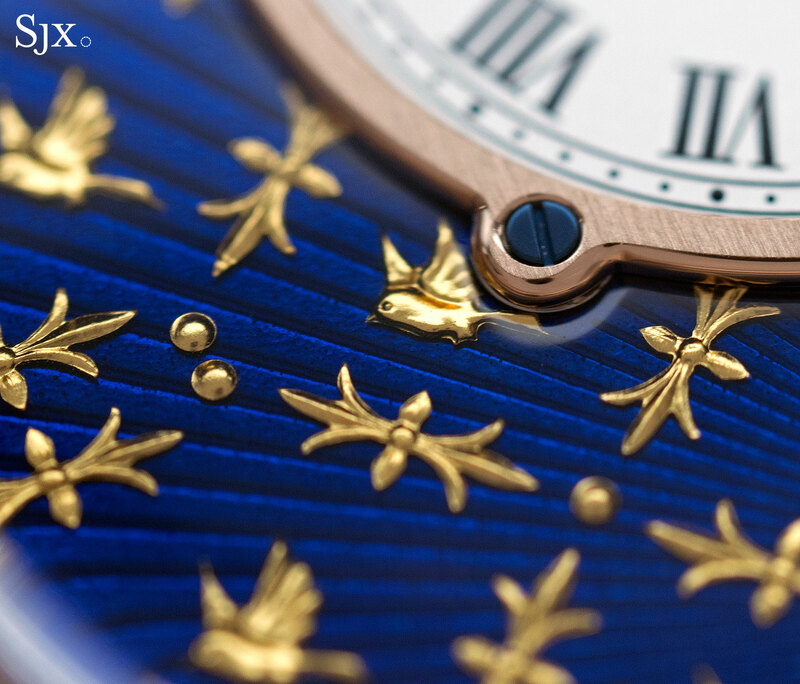 Named after the gold foil paillons inlaid on the enamel dial, the Paillonnée timepieces were amongst the first watches unveiled by the brand when it was relaunched by the Swatch Group in 2001. When your correspondent was a young enthusiast, seeing the Paillonnée watches for the first time over a decade a go was a revelatory experience. 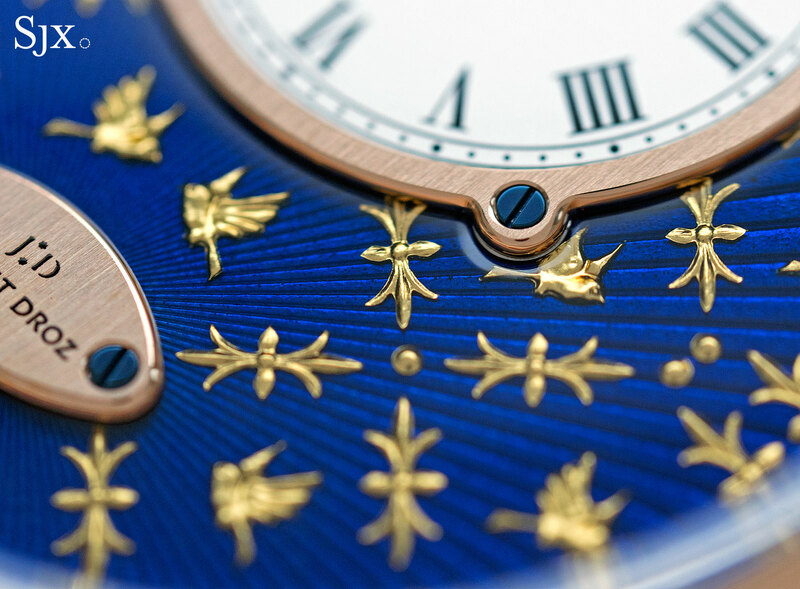 Delicately formed and intricately engraved, the paillons (which translates as “spangles”) are applied by hand on the dial, then covered with translucent vitreous enamel, forming a remarkably rich repeating pattern vivid in colour and depth. The origins of the original (more on that later) paillons is a romantic one: as the legend goes, they were wrought by hand in the 17th and 18th century, then used so sparingly over the following decades – so complex was the craft of applying them – such that a small quantity remained in the 21st century. 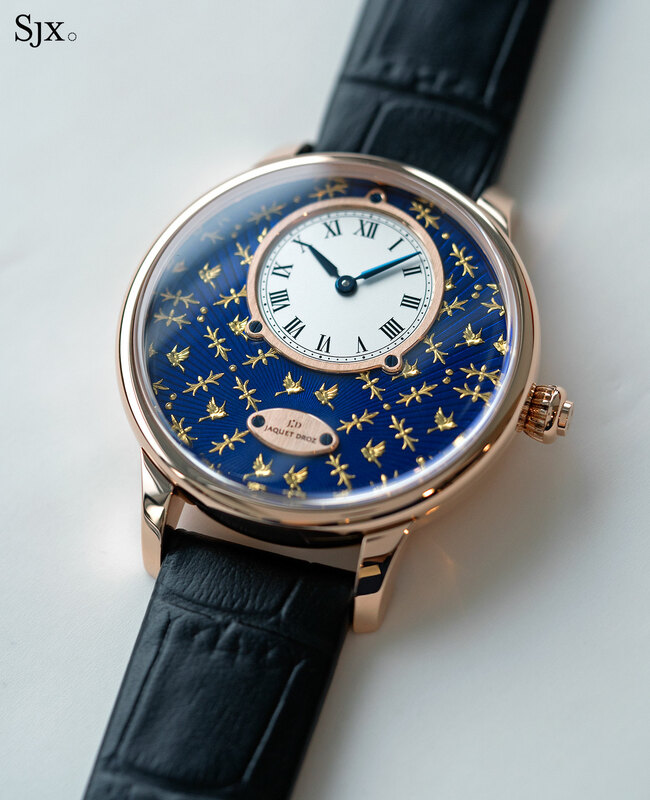 In the mid 2000s when the first series of Paillonnée watches was introduced, Jaquet Droz relied on noted enameller Anita Porchet to create the dials. Having worked for almost every major watch brand in Switzerland, Ms Porchet had (and probably still has) a stock of antique paillons which she turned into gorgeous watch dials for Jaquet Droz. 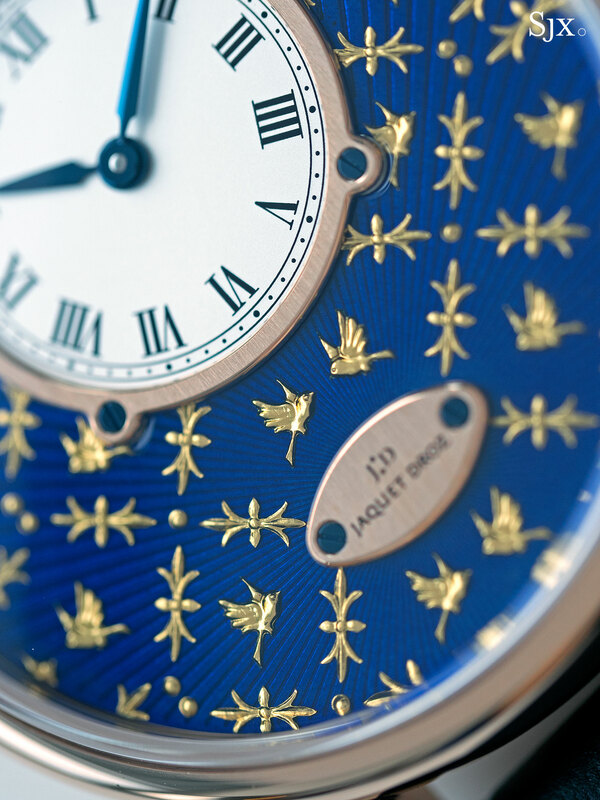 Given the nature of the dial decoration, the Paillonnée watches were made in extremely limited numbers; at the time Jaquet Droz volunteered that only about 100 Paillonnée watches would be made – ever. 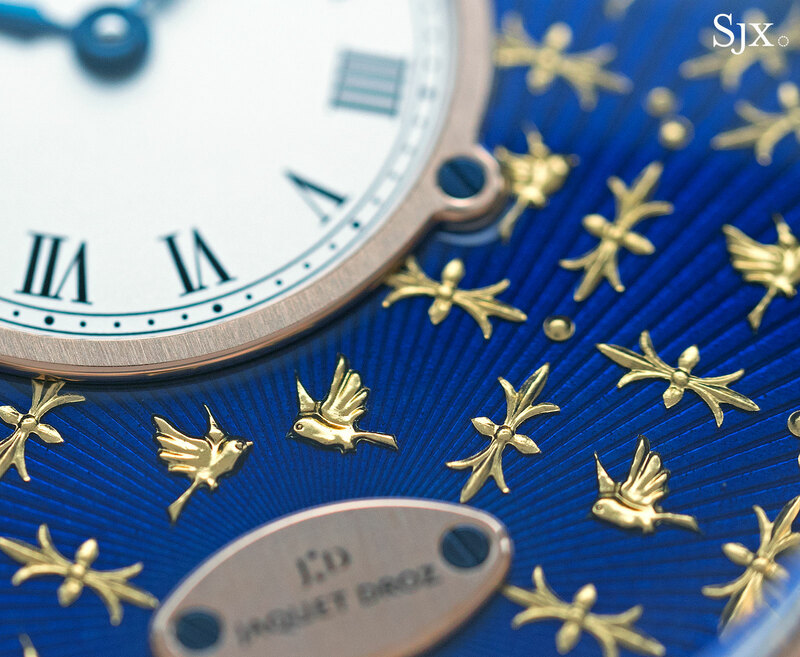 Some three or four years ago, Jaquet Droz discreetly began producing paillonnée dials on its own, leading to a diversity of colours and motifs. 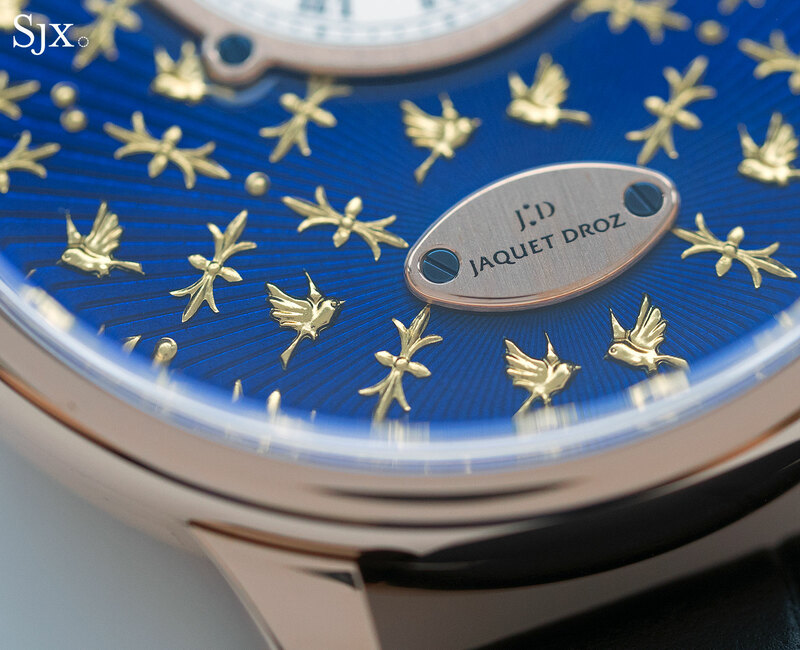 And more recently, Jaquet Droz revealed that it now makes own paillons, doing away with the need to hoard tiny tins filled with 17th century gold spangles. While that does crimp the appeal, the dials themselves remain irresistibly gorgeous. The in-house paillons have given rise to more variety, instead of curlicues and flowers that characterised them before. 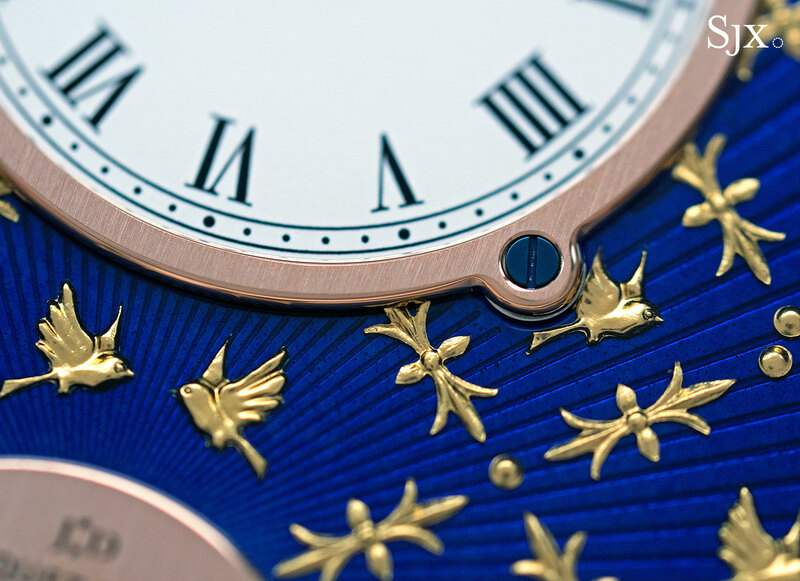 Bird-shaped paillons are the signature of the latest group of Paillonnée limited editions unveiled at Baselworld 2017; the bird being a historical motif of the brand. The Petite Heure Minute Paillonnée in 42mm case offers the largest canvas for the paillonnée decoration, with just a small sub-dial occupying a minority of the dial at 12 o’clock, leaving the rest for enamel. 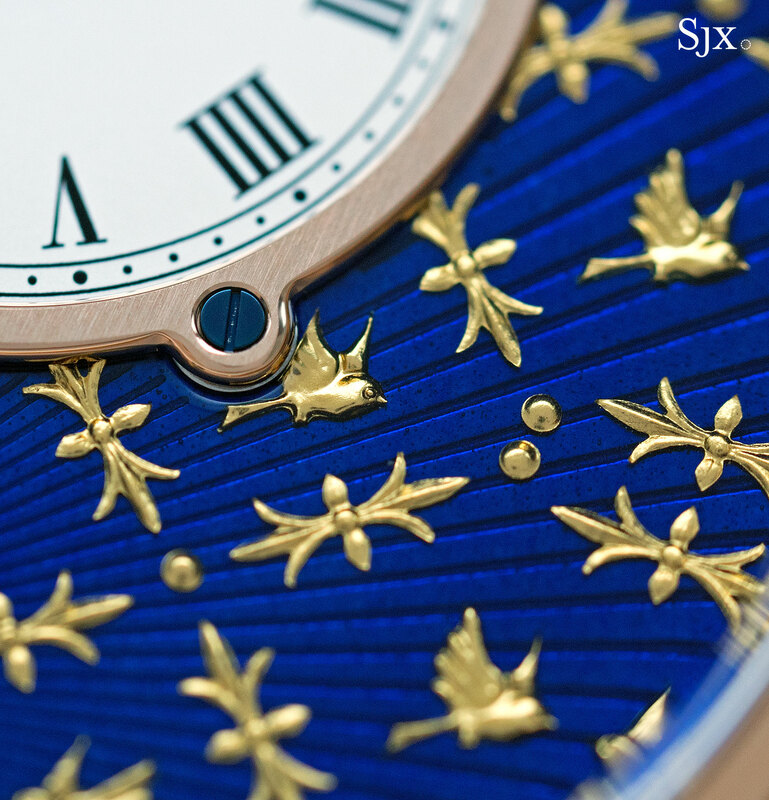 In any other watch the dial would look oddly empty but it’s hard to get enough of the paillonnée enamelling. 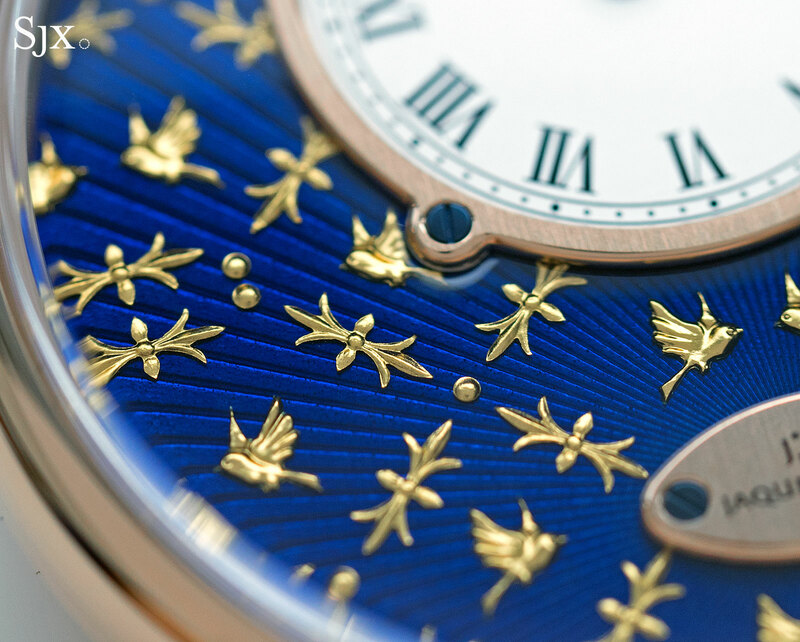 The dial plate is engraved with a radial guilloche, covered with translucent blue enamel – a technique known as champleve – and then inlaid with paillons, while being fired multiple times in between steps. Even if the paillons are new, the technique remains much the same. 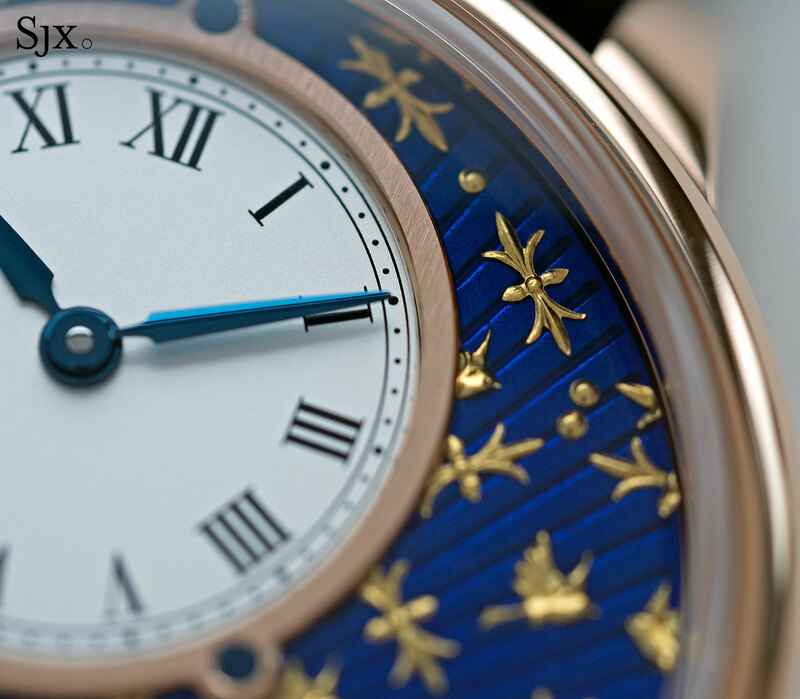 While the dial looks absolutely pristine at arm’s length, up close minuscule imperfections are visible, with dark spots indicating tiny air bubbles inside the enamel. This is a crucial and reassuring feature, since it indicates that the finish is genuine vitreous enamel, grand feu in watchmaking parlance, and not merely lacquer. Both the ring circling the time sub-dial and the logo plate are 18k red gold, secured to the dial with blued steel screws. 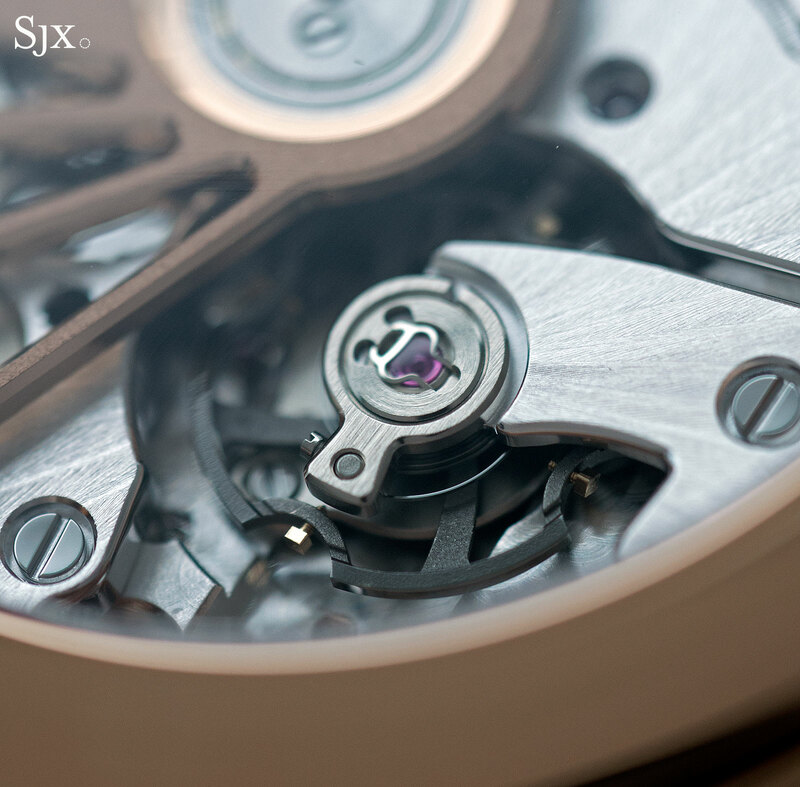 With brushed tops and polished, bevelled edges, both are carefully finished just like a component inside the movement. The dimple in the surface of the enamel where the screws connect to the dial is particularly ethereal, looking almost like the disturbed surface of a very viscous liquid. The 18k red gold case is standard Jaquet Droz, both bowl-shaped flanks, elegantly curved lugs, and a surprisingly chunky profile. At 39mm in diameter the case is the middle of the three sizes Jaquet Droz offers (35mm and 43mm are the other two), but is some thick at 12.23mm it is somewhat thick, almost as high as a chronograph. 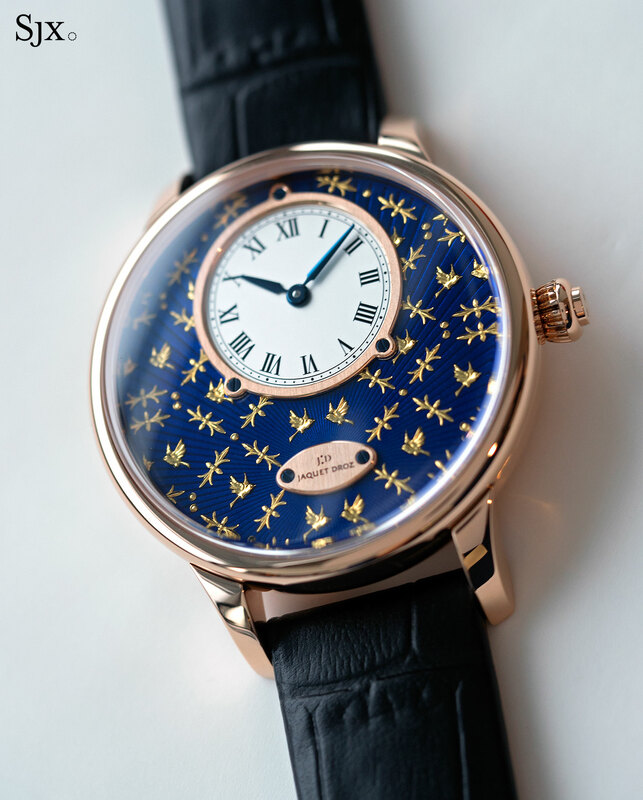 The height is in part attributable to the domed sapphire crystal and also the enamel dial; such dials are typically several times as thick as ordinary metal dials. 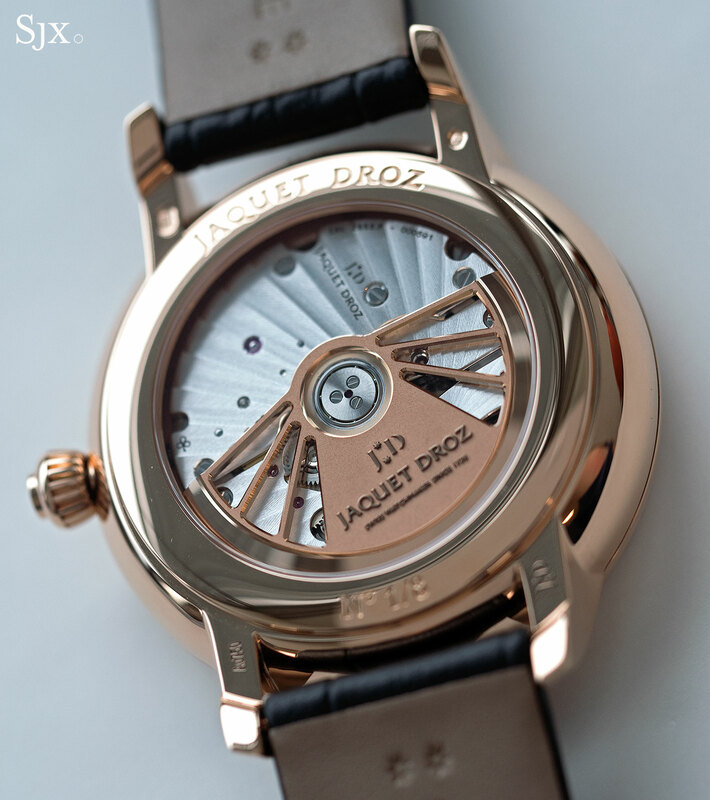 Inside is the Jaquet Droz 2653.P, a descendant of the Frederic Piguet 1150 that made its debut in 1988 (Frederic Piguet has since been renamed Manufacture Blancpain). 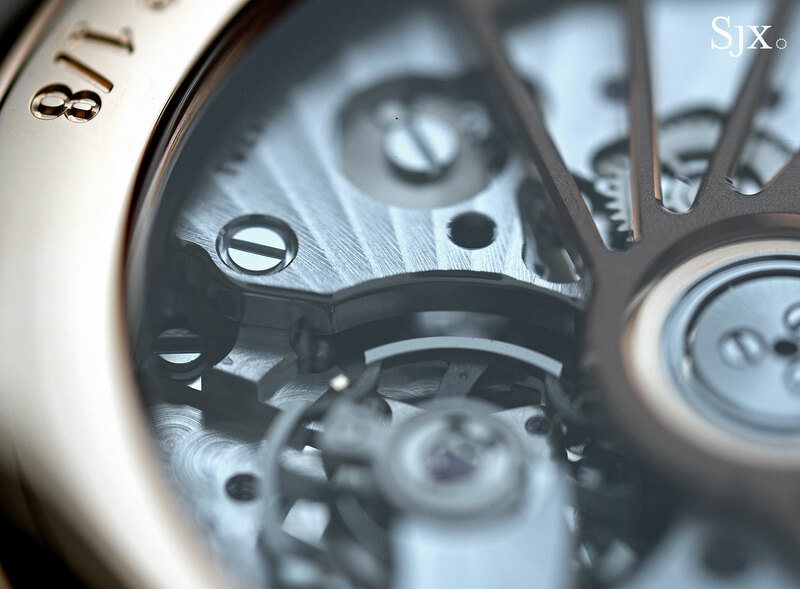 It’s a solidly constructed automatic movement with double barrels that’s used extensively amongst the Swatch Group’s high-end brands, namely Breguet and Blancpain, with tweaks to customise it for each marque. While the basic architecture of the movement is unchanged from the 1988 original, its key components have been heavily upgraded. Here it boasts an 18k red gold rotor as well as a hairspring and pallet fork made of silicon, while the adjustable mass balance wheel is titanium. And its power reserve is a respectable 68-hours. While the decoration of the movement is careful and clean, the style is distinctly modern, which is not quite in tune with the Baroque front. 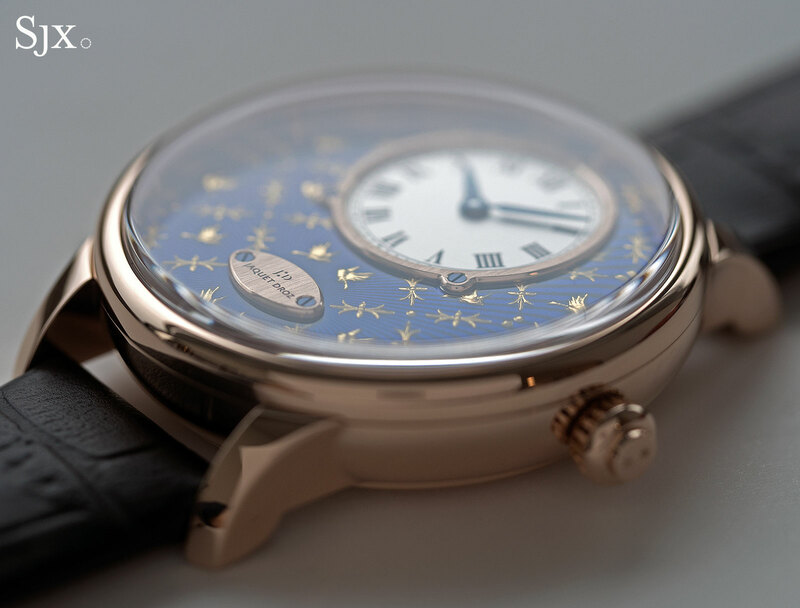 The Petite Heure Minute Paillonnée 43mm (ref. 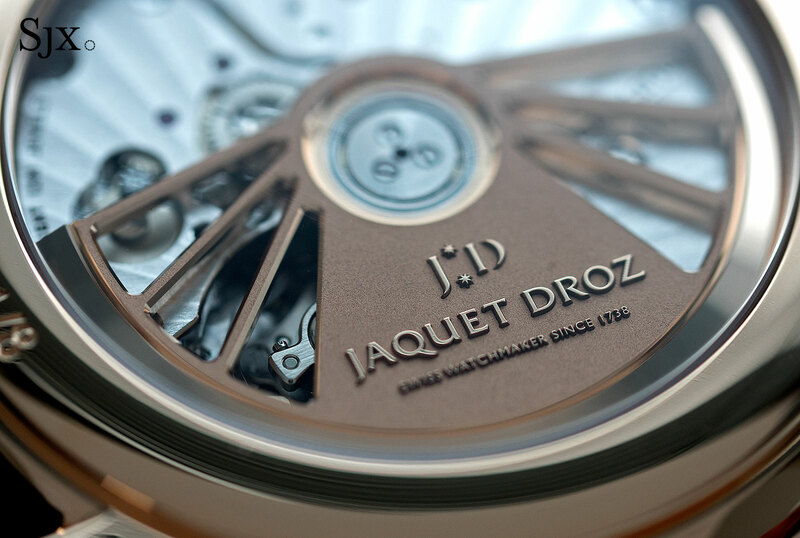 J005013247) is limited to eight pieces, and is available at Jaquet Droz retailers and boutiques. It’s priced at US$42,000 or S$67,000. Four other Paillonnée watches (including a pocket watch and a tourbillon) are available with the same paillons motif, all being part of the line-up introduced earlier this year. Correction June 13, 2017: The case diameter is 39mm, not 43mm as stated in an earlier version of the article.